"McCain teased you about a job you might get, you hit him with the faiilure of his life." During Wednesday's episode, Stewart looked at how the U.N. Disabilities Treaty brought out the jocular side of Senate rivals John McCain and John Kerry. What could bring a Republican party leader out of retirement and two Senate rivals closer together? The United Nations Disabilities Treaty, according to "Daily Show" host Jon Stewart. Calling it "unasailable and unifying," Stewart pointed out that the proposal prompted Republican party leader and World War II veteran Bob Dole to come out of retirement to give it his personal endorsement. The proposal even caused current Senate rivals John McCain and John Kerry to engage in some good-natured ribbing. At a news concerence for the disabilities treaty, Republican Sen. John McCain responded to Democratic Sen. John Kerry's introduction with "Thank you very much, Mr. Secretary," ribbing the Massachusetts senator about recent talk that he could replace Secretary of State Hillary Clinton. 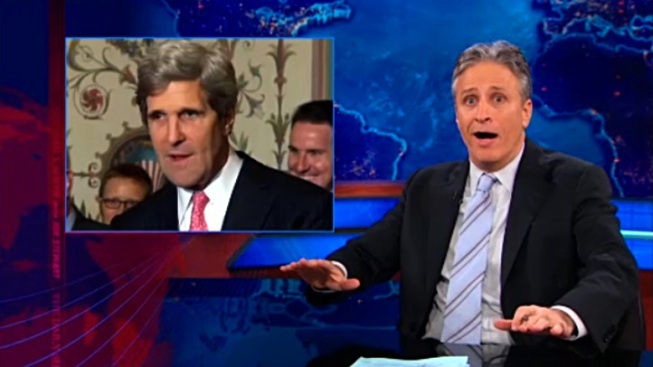 Kerry, known for his long-winded way of speaking, came back with a quick response that caught Stewart off guard. "Thank you very much, Mr. President," Kerry blithely replied. "Two things," Stewart said, after regaining his composure. "One, solid, concise joke. Two, a little disproportionate. McCain teased you about a job you might get, you hit him with the faiilure of his life."